Have you ever wondered how a library works? How books are organized, cataloged, and displayed? Are you passionate about books, technology, or information? Do you like helping people? Are you process oriented and seeking clerical work? Then the Library Technical Assistant program might be a good fit for you! What is a Library Technical Assistant? Library Technical Assistants (LTAs) are an integral part of any library team. LTAs assist librarians in the daily operations of a library. Many people are unaware but working in a library requires technical training in library operations. 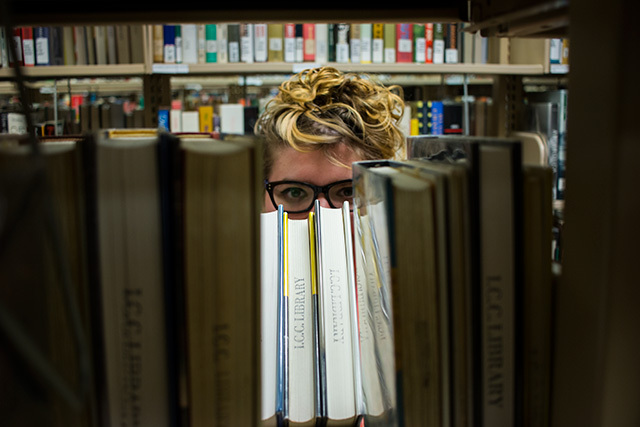 The Library Technical Assistant program at Illinois Central College provides students with the training they need to become a valuable addition to any library staff. “LTA’s bring more knowledge and care to the libraries we work in and everyone needs more of that.” – Susan Kellerstrass, former ICC student. The mission of the Library Technical Assistant Program is to prepare students for employment in various types of libraries and to provide the foundational education in library services and information studies. LTA graduates possess basic skills in: collection development, cataloging, media technology, technology troubleshooting, reference, and patron services to serve libraries and information centers. Libraries are still thriving today. According to the U.S. Labor Department, library technical assistant careers are expected to grow at a rate of 12 percent by 2022 due to libraries using these workers to take over some of the duties of librarians. So if you are looking for a career that puts a collection of books at your finger tips and gives you the ability to help others, start taking Library Technical Assistant classes today! The mission of the Library Technical Assistant Certificate program is to prepare students for employment in various types of libraries and/or for the foundational education in information management for a master’s degree in library science. LTA graduates possess collection development, cataloging, media technology, technology troubleshooting, reference, collaborative, and patron services skills and are eager to network and serve the surrounding community. The Library Technical Assistant Certificate program is designed to prepare individuals for immediate entry into positions which help library and information services professionals acquire, prepare and organize materials, and assist library users in finding materials and information. Emphasis is on acquiring practical skills needed in day-to-day operations in a library or media center.